BRYANSTON – Eleven percent of South African drivers claim to have been at the receiving end of threatening behaviour in the past 12 months, where the aggressor got out of the vehicle to confront them, according to a new survey by Synovate. Over 4,000 driving respondents in 10 markets were asked whether they have experienced various acts on the road ranging from the irritating – persistent honking of horns – to actual physical violence. Synovate also asked respondents about their own aggressive driving behaviour, as well as the primary vehicle they drive. The markets surveyed were South Africa, Greece, France, the US, Brazil, Malaysia, India, Korea, Taiwan and the UK. Despite their diversity in terms of culture, the level of economic development and even types of vehicles, all of these markets showed significant levels of aggression on the road. It is South Africa, however, that holds the unfortunate first place in this regard, with an overwhelming 67% of those interviewed reportedly experiencing some aggressive (85.1%) or threatening (11%) behaviour directed at them in the past 12 months. Hot on their heels was the UK, with Greece not far behind. Perhaps reports of road rage incidences that have led to fatalities and murder charges have led to some caution, as South African motorists tend to demonstrate their aggression from within their vehicle, using rude gestures, flashing headlights and hooting to indicate their anger. Indeed, with the exception of Greece and India, most motorists prefer to stay within the (relative) safety of their vehicle. Perhaps unsurprisingly given its anti-social context, admission to the respondents’ own aggressive behaviours was far less forthcoming. However, SA again led the field, with 62% of those interviewed admitting that they had used aggressive behaviour on the road, from verbal insults right through to physical assault. Albert McLean, Synovate’s Chief Operating Officer for Middle East/Africa, cautioned that the higher rate of admissions could itself be cause for concern. McLean explained, “We may be witnessing indicators that aggression and road rage are becoming more acceptable social behaviour in South Africa. 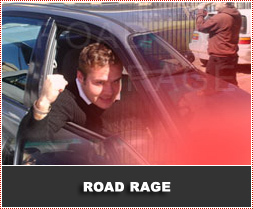 Acceptance of these behaviours will surely see an increase in aggression on our roads”. In terms of the context where aggressive behaviours occur, it seemed that rush hour was the time when South Africans generally behave poorly on the roads. Given the delays and stress on the roads, this may seem inevitable, but this was not the case in most of the other markets. In the UK, Taiwan, France and the USA, aggression was more commonly reported when driving for leisure purposes or errands. In the UK, Taiwan and France, this is most likely owing to the use of public transport infrastructure, such as trains, buses and subway / underground trains, for the commute to work in these countries. When asked to rate their behaviour as a driver, the respondents from SA tended more towards describing themselves as slow and cautious, rather than fast and reckless, although the majority rated themselves as midway between these two points. This did not differ significantly from most of the other markets surveyed. What behaviours have you EXPERIENCED FROM other drivers in the past 12 months? Synovate, the market research arm of Aegis Group plc, generates consumer insights that drive competitive marketing solutions. The network provides clients cohesive global support and a comprehensive suite of research solutions. Synovate employs over 4,000 staff in 46 countries. Synovate in South Africa was formerly known as Proactive Insight.